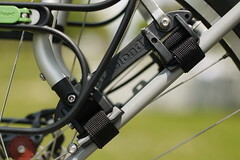 This is part of a series of posts about cycling gear I have been using lately. First up, the mighty Surly Karate Monkey. 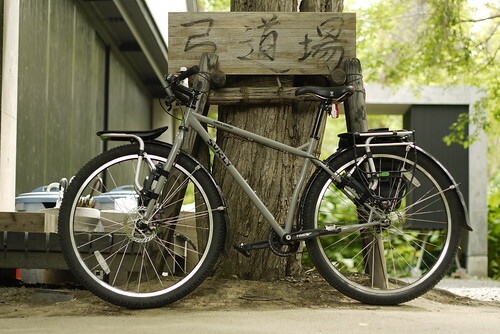 Earlier this year, I was looking into bicycle options for life here in Sapporo. I was looking for something that would be as versatile as possible, including something that would be comfortable to ride in the middle of winter here. Sapporo gets massive snowfall in winter; a yearly average of almost 600cm (6 metres!) and an average maximum snowfall in one 24 hour period of 100cm. Unless you’re riding a Surly Pugsley or Salsa Mukluk , you’re not going to be cycling over any snow deeper than 15cm or so, but the local cyclists I talked to here in Sapporo all recommended that I consider getting a 29-inch wheeled mountain bike to handle the icy/snowy conditions in winter in Hokkaido. With that advice in mind, I approached Surly and asked if they would hook me up with a Karate Monkey frame. Due to supply issues here in Japan, I ended up getting a complete Karate Monkey bike at cost (thanks Surly :-)). I opted for the Karate Monkey simply due to the reputation it has as a no-nonsense, versatile, back to basics bike. 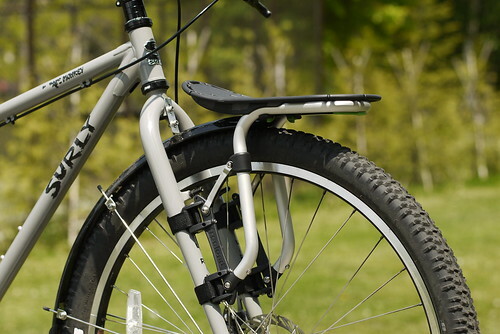 Steel frame, great build quality. The bike came set up as a single speed (33t at the front + 17t at the back + Truativ Firex 1.1 + 29-inch wheels = 56.5 gear inches). I have a Shimano Alfine 8-speed internal gear hub on order, but for the last 6 months or so I have been riding it as a single speed. The bike is awesome. I love it to bits. Stock standard with no bitsy accessories, it is like a huge BMX. So much fun. I now have it set up as a commuter/tourer (apart from the lack of gears), and it is very well behaved when loaded up. Cycling on gravel roads is really where this bike comes into its own. The stock complete bike comes with WTB 2.2 tyres, which is a helluva lot of balloon power. The 700cc rims (well, 29-inch in mountain biking marketing parlance) mean that the final diameter of the wheel is monstrously large, creating a smaller approach angle on bumps in the road, meaning you get a smoother ride. 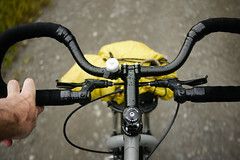 As you can see, I have installed trekking/touring bars on the bike now, which increase the comfort level up even more. Finding racks for a 29-inch disk brake bike setup can be a little challenging, however I have found that with a little tweaking the Freeload Racks do fit, and are an especially elegant solution for front racks on a Karate Monkey. They fit on more or less any bicycle on the planet (I wonder if they have tried a penny farthing), and are a great piece of ingenuity. A Freeload Rack on the back of a Karate Monkey is a little more fiddly than the front, since there is nowhere on the rear seat stays where you can get a 100% snug fit onto the frame, due to the asymmetrical spacing of the cable lugs on the Karate Monkey frame. I got the racks sitting even by adding rubber shims to both sides of the mounting feet of the Freeload Racks. Not ideal, but it does the job (and my oh my those nylon straps on the racks are strong). With shorter chainstays on the Karate Monkey, the adjust-ability of the Freeload Racks on the back of the bike is very helpful for heel clearance. You have to have the pannier mounting rails adjusted as far back as possible, but this doesn’t seem to be too much of an issue. Mounting panniers on the lower of the two pannier mounting rails helps stability even more, however, by lowers the center of gravity overall; this is a great feature of these racks, and especially welcome on a 29-er mountain bike which has a higher center of gravity to start with. 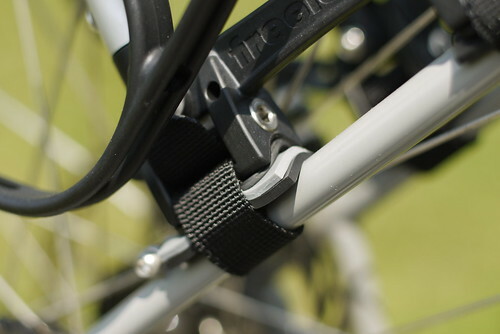 A Freeload Rack on the front of the Karate Monkey is absolutely rock-solid, and is an excellent solution to the no-rack-eyelets issue on Karate Monkey forks. 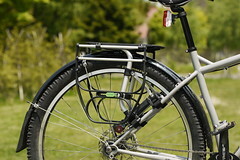 I am thinking of getting a touring platform (one with pannier rails) for the front, as I can imagine that this would be an awesome option for carrying panniers on the front of the bike. 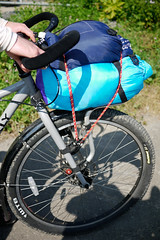 On a recent 8 day tour, the “Sports platform” was handy for carrying bulky items such as synthetic sleeping bags or wet tent flies. Disclaimer: Freeload Racks sent me a pair of their racks free of charge to test and provide feedback. How does the Karate Monkey compare with the recumbent you used for your Asia-Europe tour? I'm thinking about getting another recumbent after having to sell mine and after experiencing some pain/discomfort on my tour of the Netherlands and Belgium this month on my "normal" bike. Hi Andy, thanks for the comment. It is really quite hard to compare the Karate Monkey with the HPVelotechnik Street Machine GTe. The Karate Monkey is a 29er mountain bike which I am tailoring to touring and winter commuting. The Street Machine GTe was a super comfortable full suspension touring recumbent. Both shine; both are awesome bikes. If price is no issue, then I would go for the Street Machine GTe in an instant. Throw some studded tires on it for winter, and it would be great. It probably would not handle icy ruts as well as a mountain bike (there is something to be said for being able to lift the front wheel over obstacles), but for everything else it would be fine. In terms of pain/discomfort, I do find that I get sore hands on the upright bike, even with the trekking bars. This would probably be remedied by some cycling gloves though. The MTB SST seat, which came standard with the Karate Monkey, is surprisingly comfy, although I have a Selle An-Atomica leather seat coming soon, which should be even more comfy. 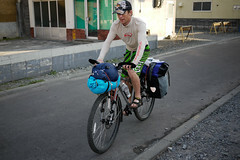 What I loved about the recumbent, was that no 'cycling-specific' clothing was needed. What I love about the Karate Monkey, is that I can really take it off-road with more ease than the Street Machine GTe. One last thing: one thing I really miss is having full suspension. But not just any full supsension; on the GTe, all your luggage is suspended as well, which is a great thing! Thanks for the detailed reply Rob. I guess a "normal" DF bike and recumbent are hard to compare like for like. When I was on my tour last month I remember thinking I wish I had a recumbent but at some times I also thought a recumbent could be a bit of a hindrance. Things like using the bikes to nip into a town from the campsite and leaving them lock in the center of town wouldn't be ideal of a recumbent. I think on balance though a recumbent is the way to go. It is a possible dream in the next few years to maybe do a really long tour, something like UK-China (not sure if I could hack it) or across America, something like that. I think for something that long a recumbent would be the best. I have really been enjoying the great trip reports from Japan and your photography is amazing. One day maybe a cycle tour around Japan could be on the cards. I think it might be expensive though! One other thing I miss about the recumbent is the view. That is, on the recumbent, your default head position is such that your field of view is straight ahead. You are free to look up and side to side without too much effort. On the DF bike, it is more of a conscious effort to look up to the sky. I love any camping, especially wild camping (as long as the area is not dangerous). $20 a day doesn't sound too bad. Plane ride over from the UK with a bike might cost some though!!! I have wanted to visit Japan for years but always been put off by the prices. I also wanted to visit the countryside not just the cities so maybe a cycle tour is seriously worth considering. How much cycle infrastructure/paths are there? So far I have only toured in Europe in countries that have extensive cycle tracks and mixing it with cars isn't too fun. The cycle infrastructure is quite limited here, but most roads have sidewalks on at least one side of the road (even in the countryside). The trick is to avoid the main busy roads (which can be difficult in much of Honshu). Recently got a set of Ogre forks for my karate monkey and now have a Surly Nice Rack in front with a Wald basket. 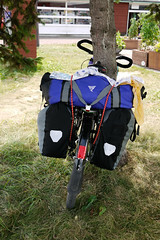 I use small front panniers when touring. Love this set up. Just wondering what fenders you are using? Hey! What made you go for the Karate Monkey instead of a Troll or Ogre (ie. something designed for touring?) Great website, btw. Gotcha. We are coming to Hokkaido in July for some touring. Can’t wait.